1 Brush light Italian dressing on mushroom and red pepper. Grill, turning once, 8 minutes or until vegetables are tender; slice. 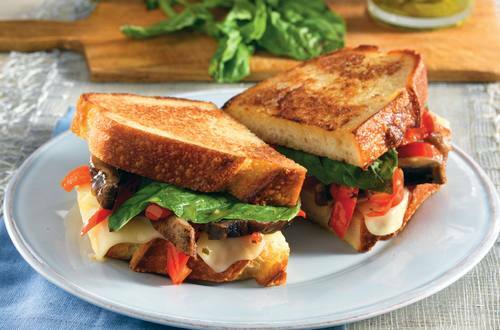 Arrange mushroom, red pepper, cheese and basil on 2 bread slices; top with remaining 2 bread slices. Spread Hellmann's® or Best Foods® Light Mayonnaise on outside of sandwich. 2 Grill sandwich or cook in 12-inch nonstick skillet over medium heat, turning once, 6 minutes or until bread is toasted and cheese is melted.